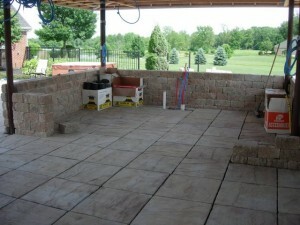 Progress is continuing on the outdoor living project previously discussed here. The perimeter walls are going up now. These walls are solid concrete retaining wall block. 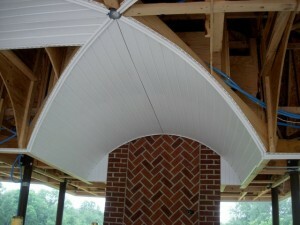 They are double sided allowing them to be dry stacked vertically and used as both the inner and outer wall finish. A separate cap stone will be installed where the wall serves a a seat wall. Around the kitchen area, shown in the progress picture to the right, a granite counter top will be installed once the stainless steel kitchen appliances and cabinets are in place. The stone floor progress can be seen in this picture as well. We are currently waiting for the bar stool structures to be delivered. They will be installed using a cantilever support system by Seating Innovations that will be mounted to the floor behind the wall. It will then extend through the wall. The chairs themselves will be aluminum to simulate the stainless steel finish of the cabinets. The seats will be cherry. The seats do not come with an outdoor finish from the factory, so we will be getting them raw and field finishing them with a marine finish. It will require maintenance, but should be good for several years before retreatment. We’re installing the ceiling at this time as well. 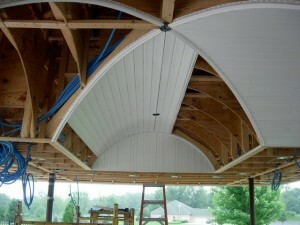 We are using vinyl soffit material as the ceiling finish. The flexibility of the vinyl allows it to conform to the wood framework of the barrel ceiling. The ceiling is being installed using screws to allow for future accessibility. This will allow access to the attic area for additions or changes to the electrical system or sound system. Can lighting is being installed throughout along with some ceiling fans and chandeliers. There are also surround sound speakers planned for enhanced television viewing. There will be hurricane shutters that require periodic maintenance as well. When necessary, the ceiling can be removed to access the shutters and actually lower them for service if necessary. We were recently called back to complete some remodeling on a home that we had been to several times in the past. 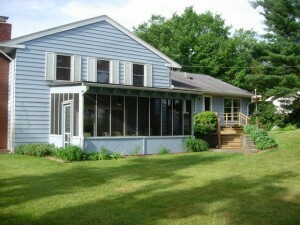 One of the projects we completed for the previous owner was the addition of a screened porch and new rear entrance. Before the addition, there had been a small landing in front of the lower level doors. The door on the upper lever was disconnected from the lower level with a steep slope between the two.